Beautifully delicate looking but substantial pieces of silver jewellery. Each item is 29mm long and 14mm wide (max) with the pendant being 34mm long and sold with a free 18" silver chain. 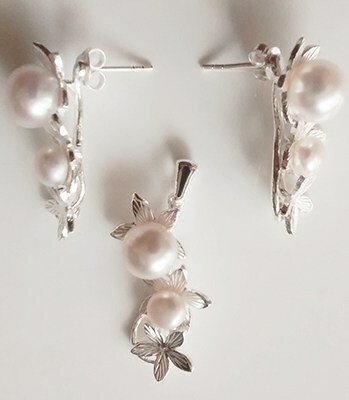 Both pieces are set with 6mm and 9mm, white pearls. Can be bought as a set to save money or on their own.